The final leg of the three-race HOTWOOD Tri-Holiday Series took place at Stockton 99 Speedway this week for the Western Late Models running in the NASCAR/Union 76 Gas Weekly Racing Series presented by Dodge. Wes Miller of Delhi took the final 100-lap segment, but Harry Belletto of Modesto became the overall series champion with the luck, his-not theirs, of eight yellow flags that sidelined the major competition and allowed him a slim 16-point margin of victory at the end. Paul Dorritty Jr, of Modesto, #44, beat Verg Beaty of Ceres to the first lap lead on the initial green with the first yellow falling on lap-five As Miller was sighted for spinning Beaty in turn one. The resulting pile up involved fast timer Eddie Laws, #02, of Citrus Heights, Beaty, and Pete Anderson, Jr. of Stockton with cars already being lapped under the three-lap yellow-before pitting rule, in effect. Tracy Bolin of Valley took the lead on the restart with Belletto advancing to second on the next pass. 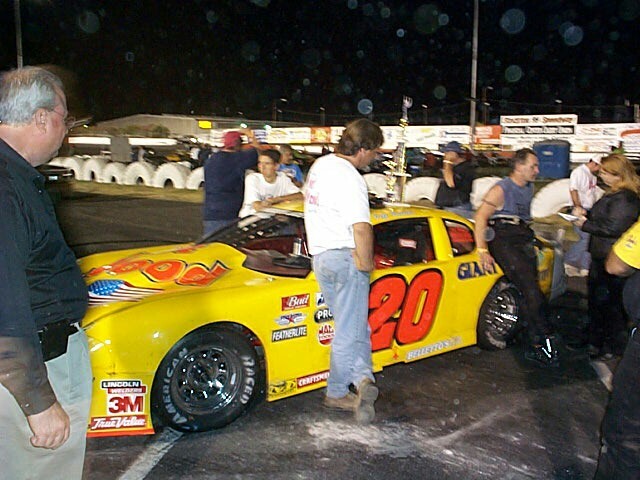 Belletto, the dash winner on the night, had started seventh on the 21-car field. Pete Ramirez of Manteca spun to bring out a yellow on lap-14 and Belletto beat Bolin to the flag to take the lead in a restart consisting of himself, Bolin, Harold Rieker of Orangevale, Dorritty, and Melissa Davis of Santa Rosa. A flat tire on Anthony Swan of Newark halted the show on lap-30 with Rieker, #12, moving to second on lap-38 to be spun by Bolin with no yellow as Rieker continued on. A yellow for debris on lap-40 saw Bolin sent to the rear for his spin of Rieker and a restart of Belletto, Dorritty, John Moore of Granite Bay, Miller, and Buzz Devore of Stockton. Belletto’s night came to an end of sorts as a yellow fell on lap-46 for a tangle between Chris Monez of Lodi and Walt Haas of Antioch in turn one. 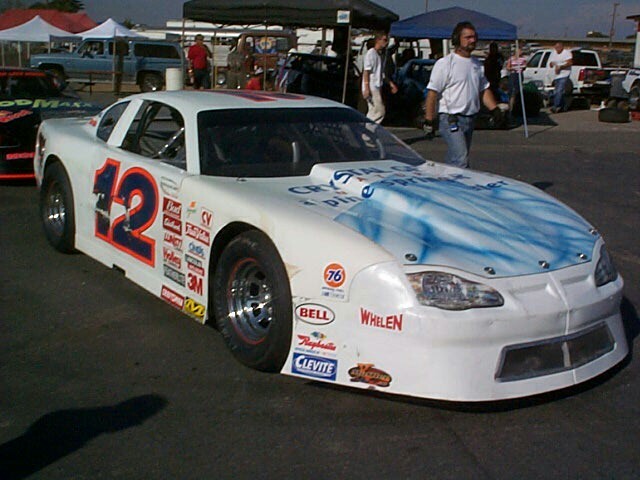 A red was thrown for oil on the track that led to Belletto’s car and a broken Snap ring on the transmission. 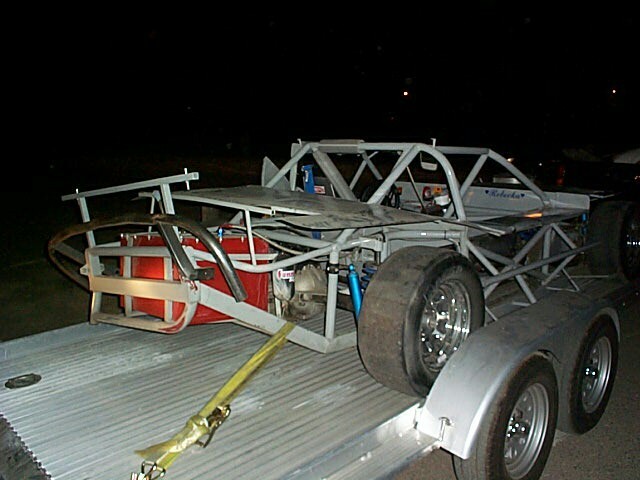 Belletto was forced to pit and was several laps down before returning to the fray. Wes Miller, driving a car loaned to him by Owner Doug Ollis and driver Jeff Belletto, both of Modesto, restarted as the leader with yet another caution coming out on lap-53 when Bolin and Brock Monroe of Escalon tangled going into turn one and Monez piled into Bolin. 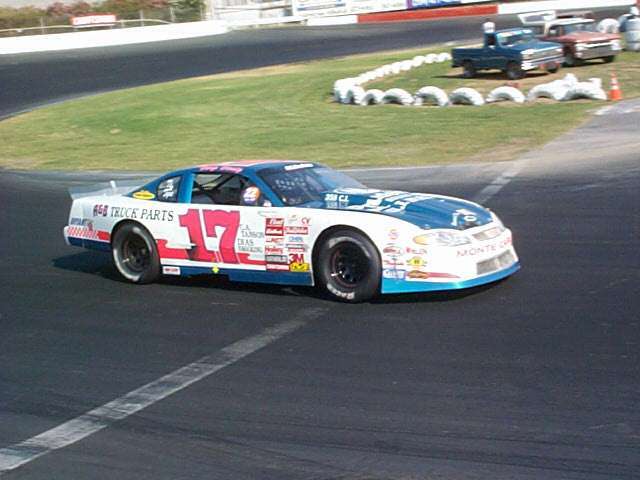 A quick yellow for a stalled ride on lap-58 was the only halt on the way to lap-88 as a major red flew when Beaty, #17, thinking himself clear, dove low and into Monez going into turn-one. Both cars locked and twisted as Monez took a hard shot against the turn-one wall and his entire fiberglass body was ripped from the car. After getting dirt flushed from his eyes and a trip to the local hospital for a quick check, Monez was OK. To see more pix, click here. A final yellow on lap-92 set the stage for an up-car battle to the checkered that was won by Miller over Moore, Rieker, Dorritty, and Monroe. Belletto’s overall season point lead now stands at 174 over second place runner Miller, with Bolin five back of Miller and Anderson in fourth. Kannai Scantlen of Stockton and Tom Bolin of San Jose led the first lap of the Pure Stock feature with Bolin taking charge on lap-10. Scantlen and Cindy Freitas of Lodi tangled off turn-two with Charlie Clawson sliding into Freitas on lap-17. Joey Stearns took the point on lap-23 and never looked back as he scored his third 2002 season win over fast timer and dash winner #1, Michael Wendt of Lodi. Aimee Sullivan of Lodi ran third ahead of incoming point leader and defending champion Danny Guibor of Manteca. C.W. Davis of Stockton rounded out the top five. 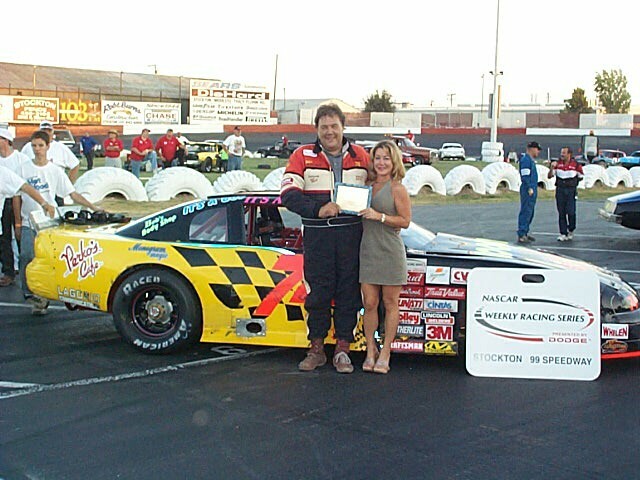 Guibor now leads Johnny Bird of Stockton by 140 points in the title battle. Seven lead changes made for a wild BCRA/USAC season ender this week with Ken Bonnema leading the first three laps and the rest of the night divided between leads by Marc DeBeaumont, #11, and Alex Harris, #57, with Harris leading the one that counted. 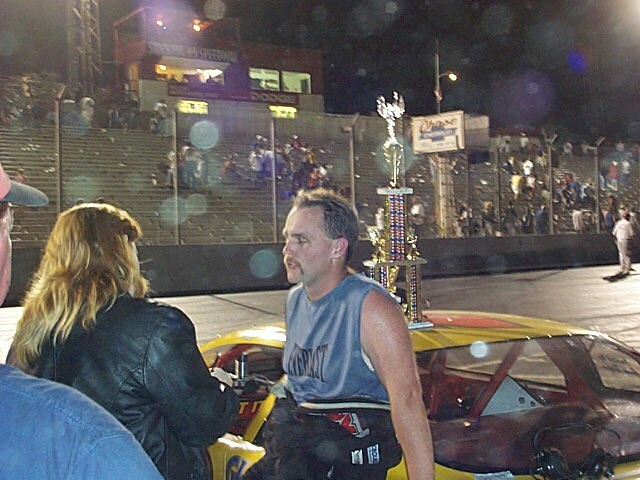 Floyd Alvis of San Carlos was declared the BCRA overall season champion for the sixth time in his long career, with the local level Stockton championship going to DeBeaumont by virtue of better feature finishes in the five race series over Alvis, who tied him in actual points. 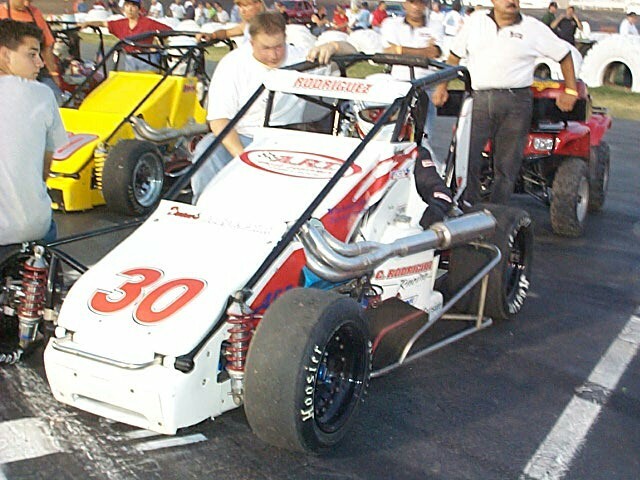 Johnny Rodriguez, #30, set the fast time with heat wins going to Cliff Servetti and DeBeaumont. 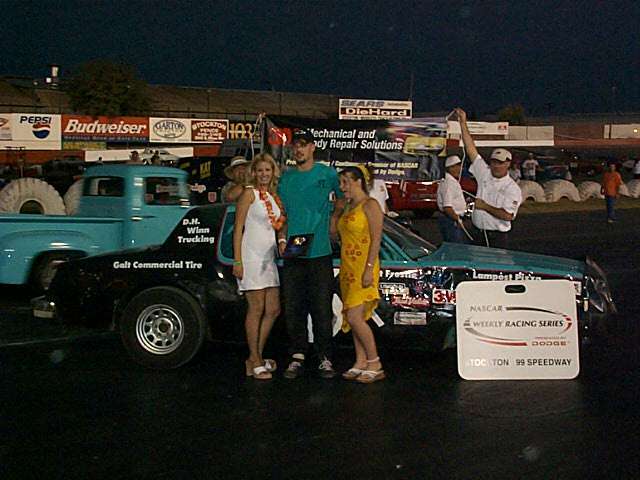 The night was rounded out with a 30-lap Pro-Four-Mini Truck feature that went non-yellow. It only took four laps for fifth place starter, #14, Gary Franks of Manteca to take the lead from early leader Troy Ermish of Fremont and add the win to his fast time and dash win performance on the night. 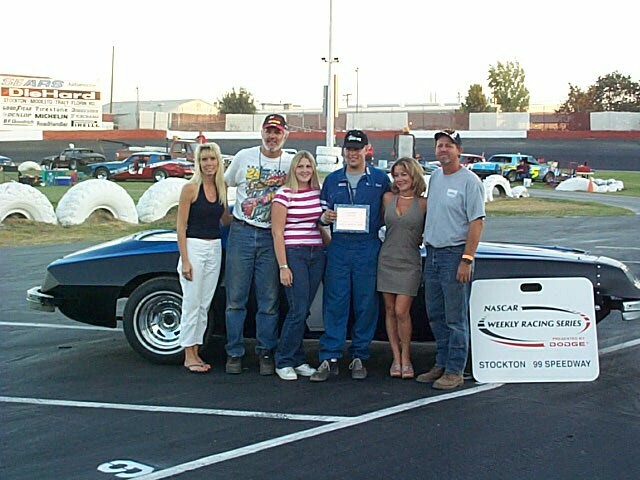 Ermish finished second over, #27, Carrie Miller of Saratoga, Mike Frank of Denair, and Bret Barney. Stockton Speedway will be closed on September 9th, but will return to action on September 14th with a double point program for Western Late Models, Grand American Modifieds, and Pure Stocks. 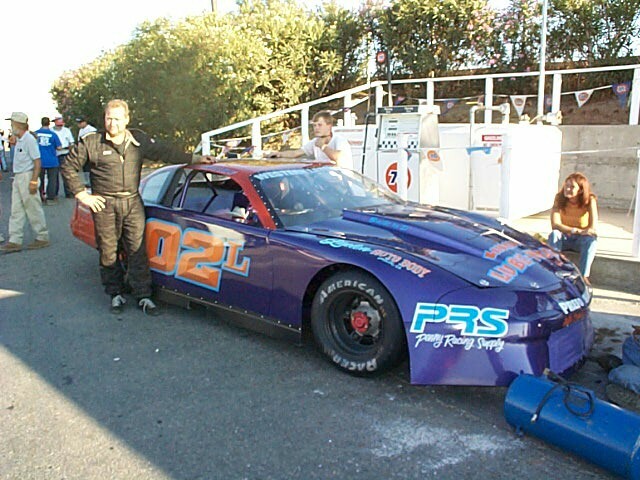 The third of four SRL Tri-Track Late Model events will be held, and the Legends of the Pacific will also be on hand. 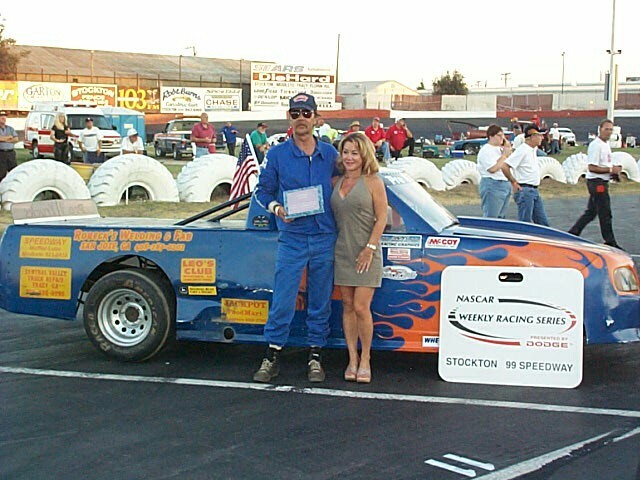 STOCKTON, CA, AUG. 31: Seven leads changes highlighted a spirited battle for the win with Alex Harris claiming the victory in the co-sanctioned Bay Cities Racing Association/Western States United States Auto Club midget shootout in the fifth and final 2002 "Midget Thunder" program at the Stockton "99" Speedway.Harris drove the Rich Terranova Esslinger/Beast to the 30-lap win after exchanging the lead with Marc DeBeaumont over the final two-thirds of the feature on the banked paved oval to the delight of the crowd.Ken Bonnema led off the main event aboard his Esslinger/Edmunds. 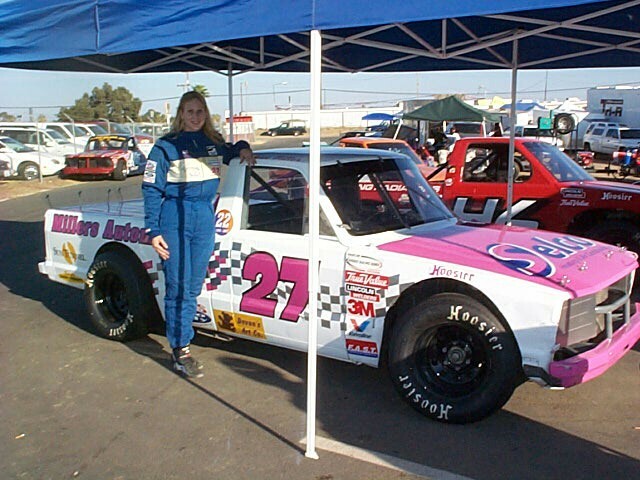 DeBeaumont started fourth in the DW Motorsports Ed Pink Ford/Stealth. The Western States Stealth distributor progressed to third, second and the lead over the first three laps as Bonnema dropped to second over Desi Bray and seventh-starting Floyd Alvis.Harris, from eighth, began a steady move forward as Alvis claimed second on the fifth circuit. One lap later Harris moved up behind Alvis and wrestled past the veteran for second on the ninth lap, then set his sights on the leader. On lap 11 John Harkrader exited turn-2 and dropped low, striking Tim Joyce, resulting in a spin and slow roll to bring out the red flag. Uprighted and inspected, Harkrader returned to the rear of the field.At the resumption, Harris began his assault on DeBeaumont, taking the lead on the 12th round. DeBeaumont came back to lead Harris across the line on the 15th circuit, only to be passed back by Harris on the next lap. Harris barley held on to his lead until the lap-19 when DeBeaumont again edged by for the lead, only to lose it back to Harris the following lap. Now it was Harris who could only hold on for a single lap as DeBeaumont again came back to claim lap 21.DeBeaumont's valiant efforts ended when Harris took back the lead for the final time, pacing the field over the remaining nine laps.During the fierce competition for the lead Alvis was hanging on to third with Glen Carson's Bock Esslinger/Stewart up to fourth and Cliff Servetti moving into fifth. 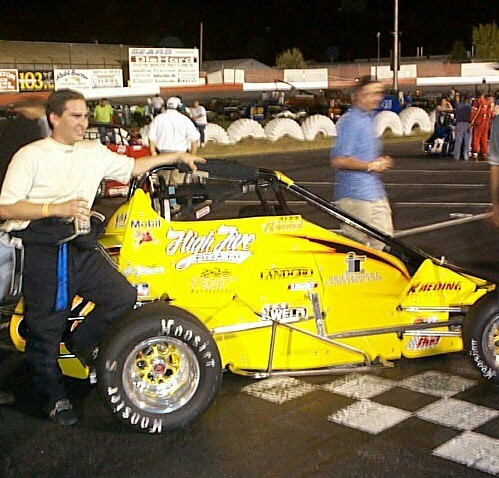 Carson dropped Alvis to fourth on the 23rd round.To this point Washingtonian Rory Price and local sprint car pilot Johnny Rodriguez had hardly been noticed, but both became players as the race progressed. Price moved his Price/Westlake Esslinger/TCR by Alvis on lap-24 and Rodriguez moved his Esslinger/Beast by BCRA's defending champion on the next round to claim fifth. Price pressured Carson until the 27th round and took over the third position. Price, Carson and Rodriguez held close to the Harris/DeBeaumont battle, but could not progress any further, following Harris and DeBeaumont across the line at starter John Moreland's checkered flag. Bringing up sixth was the Interstate Batteries VanDyne/Stealth of Alvis, followed by Servetti's Custom Engine Brayton Buick/Stealth, Idaho's Stuart Birkenbine, Bonnema, Harkrader, Bray, Bill Lindsey, Ken Molica and Ralph Cortez.As the cars decelerated, they all came around to the finish line and pulled to a stop in celebration of the assured 2002 championships of Alvis as BCRA driver and Lindsey as BCRA car owner. The pair's point advantage cannot be challenged over the final two BCRA races of the season. 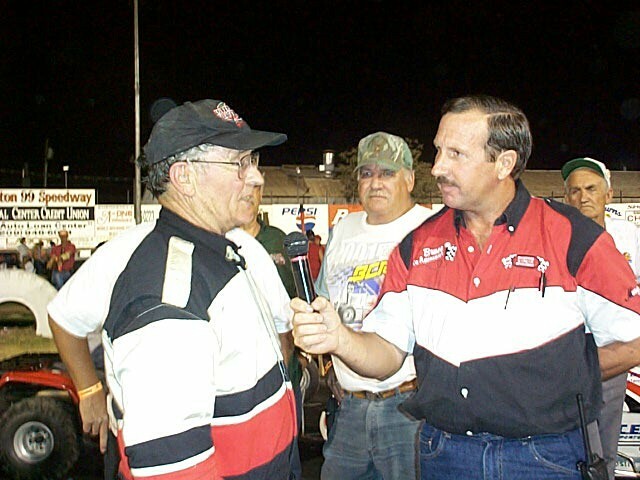 This marked the record-breaking sixth championship for Alvis, who was one day short of his 68th birthday. 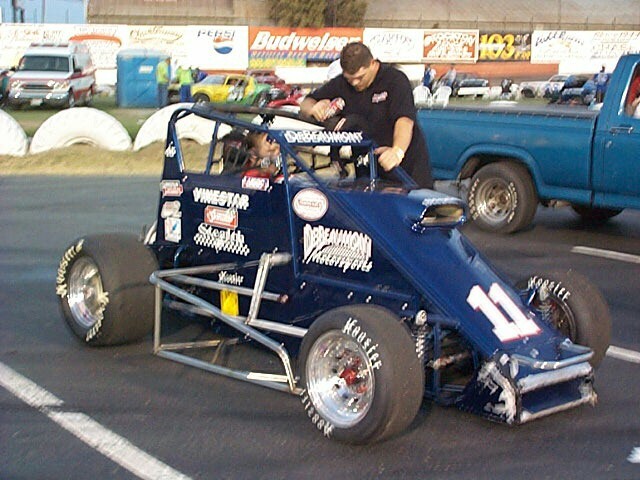 It is the first championship for Lindsey, one of the few crossover car owners and drivers who has earned points at every BCRA and co-sanctioned race during the season.Also at the conclusion of the race it was announced that the 2002 Stockton "99" Speedway midget championship had wound up with a tie between Alvis and DeBeaumont. 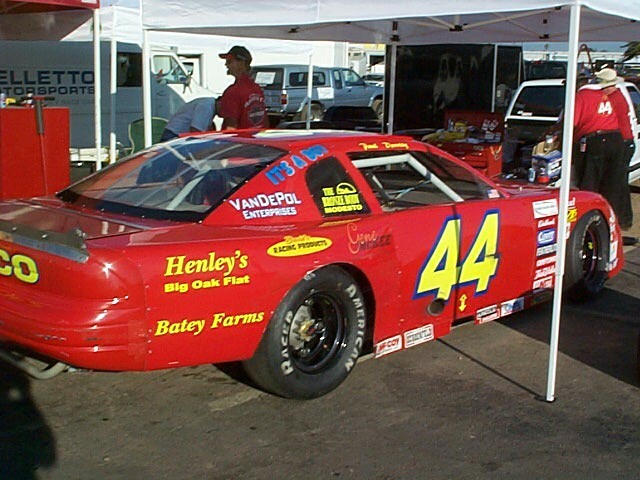 DeBeaumont got the nod as champion because of his higher finishing record over the five Stockton races.Rodriguez took the fast time honors during qualifying. Servetti claimed the first heat race over Harris and Rodriguez with DeBeaumont taking the second 10-lapper over Price and Alvis.